As part of my Sunday Dinner Series, I wanted to get up this BOMB mac and cheese that I cooked for some fam and friends on a recent Sunday evening. Who doesn't love comfort food like mac and cheese? No one! Because everyone loves mac and cheese, and what better way to spice up this delicious dish, than adding some good ol' seafood?! I paired this dish with grilled chicken (which can also be added to the recipe), and a yummy dessert to top it off. 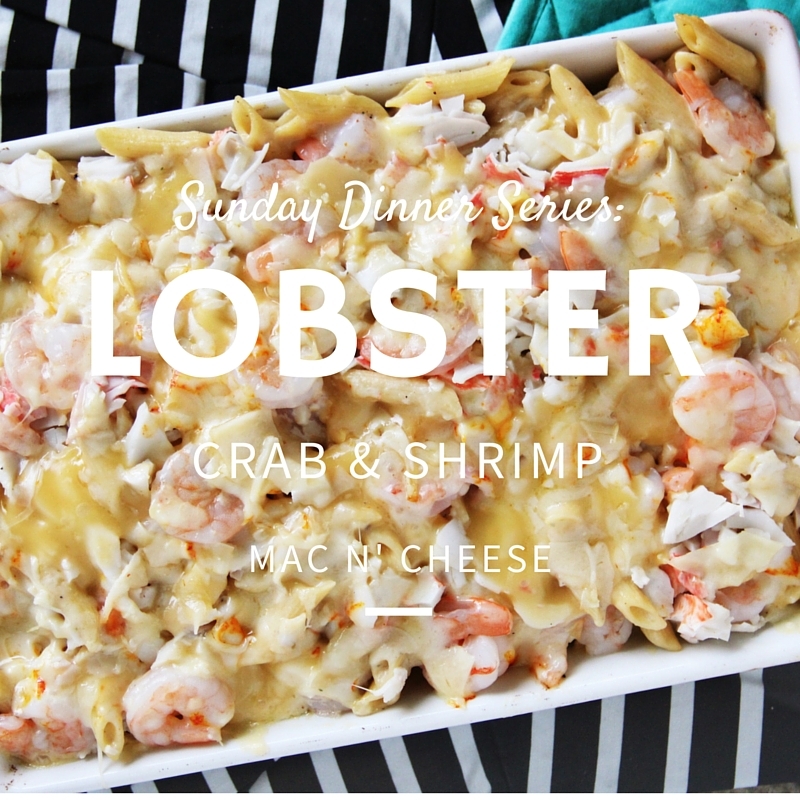 To try my Lobster, Crab and Shrimp Mac n Cheese, keep reading! In a large stock pot, bring 3 quarts of water to a boil over high heat. Season the boiling water, with 3 Tablespoons of salt. Cook until just al dente or 2 minutes short of the suggested cooking time on the package. Once done, drain the pasta, DO NOT rinse, and toss with 1 or 2 tablespoons of olive oil or vegetable oil to keep it from sticking together while the sauce is being cooked. Preheat the milk and half & half together in the microwave, about 3 to 4 minutes. Next, in a large skillet melt the butter and olive oil together over medium-high heat. Add the onions and sauté for about 3 to 4 minutes or until soft. Add the chopped garlic and thyme and cook for another minute. Add and stir in the flour, cook for about 2 minutes. (This is a roux. Do not brown it.) Next, while whisking vigorously add all of the milk mixture to the roux. Whisk until the sauce is smooth and has no lumps. Once it’s smooth, turn the heat down to medium. Add the salt, pepper, Grand Diamond All Purpose Seasoning and hot sauce to taste. Simmer for about 5 to 8 minutes or until the sauce has thickened. Whisk occasionally to keep it from sticking. Next, add 2½ cups of the grated chesses to the sauce (reserve 2½ cups for layering) and stir just until the cheese melts and the sauce is combined. Turn off the heat. Stir in the drained pasta. I had family and friends over to enjoy this dish, and it was dee-lish!! I loved the LCS Mac n Cheese, and can't wait to make it again. Good thing with this recipe, you can really do what you want as far as types of cheeses, and the ingredients you add. For example, adding chicken! I hope you have time to sit down with the people you love today, and make this awesome dish for dinner. I can't wait to see your photos of the LCS Mac n' Cheese and hear about how much you liked it!